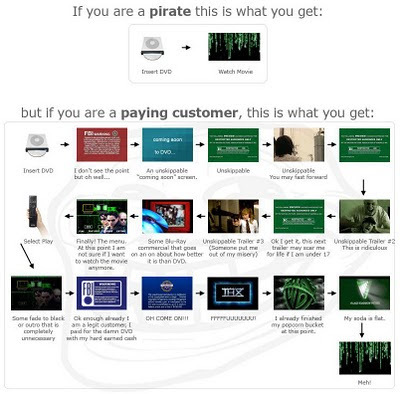 The DVD User Experience - Pirates do it better! From TheNextWeb comes this clever graphic illustrating the difference between a user's experience with a pirated DVD versus a purchased DVD. The problem? The pirated version is waaaay better! Pirates, of course, omit all the B.S. that comes with regular DVDs - the FBI warning, the MPAA ratings, the disclaimer that "opinions are those of the people giving them" (I've never understood why those are necessary), and worst of all, the previews and other drivel that can't be skipped with the chapter-forward or menu buttons. Seriously, how frustrating is it to have those buttons, only to be told "that operation is not available here?" It turns your DVD player into an obstinate, stubborn, unreasonable little brat. Thanks, pirates, for solving the problem! I was wondering when you were going to write about P-UOPs. They are the very definition of 'unpressable buttons'. I especially enjoy when they make it so there are trailers that you can't skip. Again, piracy wins in UX.